37 days, y'all. 37 days till October 1st and we can reasonably tell ourselves that the worst of the heat is over. Actually, I only have 31 actual days to suffer through here on my corner of Katy, since I'll be in Raleigh, North Carolina for 6 days at the end of September. I'm attending the Garden Writers of America conference, which promises to be a great deal of fun as well as very educational. And I hear there are some cool freebies, too! I'm excited to have another chance to hang out with some of the garden bloggers I've gotten to know through the garden bloggers' spring flings. One of the scheduled tours is a visit to Plant Delights Nursery and I expect to feel like a kid in a candy store! Y'all can expect to see some of the goodies I bring home on a future look through the garden gate! As for what there is to see today, by the time I made it out there, here's the usual view. It would behoove the Head Gardener in future to take into consideration the amazing growing power of Ipomoea batatas 'Blackie', the ebony purple hued sweet potato vine, before she sticks it any old where. Can you see the ribbon of purple running down the center of the picture? There's a flagstone sidewalk under all that vine, as you can just barely see in the picture below. Blackie is also creeping onto the patio, into the path, through the fence and would probably head across the alley given a chance. The Rock Rose, Pavonia lasiopetala, has been looking less than happy most of the summer. 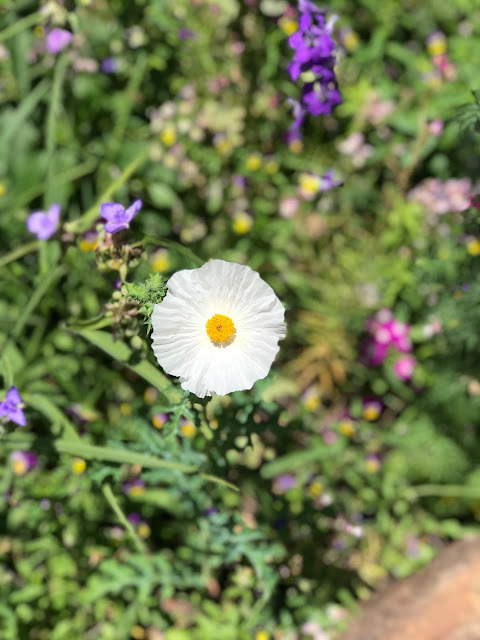 The Head Gardener thinks it's a good reminder that we shouldn't expect too much from a plant just because it's considered to be drought tolerant. Tolerating drought and thriving in it are two very different things: look at how healthy and floriferous the Pavonia is now that we've had several good rain showers on my corner of Katy! The Head Gardener and I had a brainstorm today and even though we had to walk through the garden gate and down the garden path to document the results, we wanted to share it with y'all. Even though my wonderful pond guy repotted and fertilized both water lilies when he did my pond cleaning this spring, the Perry's Baby Red water lily has yet to bloom. I finally decided that the pond is just too shady for this baby and moved it into a large tub last week. As the Head Gardener was trundling the old wheelbarrow away, it occurred to us that it was just the right size to hold that water lily! So we placed it on the south patio, set the water lily inside and added water. That area gets enough direct sun that we're optimistic we'll have blooms before cold weather arrives. While I was there, I took a couple of shots of the garden from that vantage point. You can see in the second picture just how shady the pond area is (it's the large dark hole between the two chairs). I'll wrap it up with a picture of the Laura Bush Petunias that I cut back a couple of weeks ago. They're looking much happier for that haircut and the rain! You are so right about the difference between tolerating drought or dryness & thriving in it. At this point, so many of my plants look the worse for wear because of dryness, and we aren't even in a drought. I think your plants are amazing for performing so well under awful conditions. I love the wheelbarrow waterlily pond! I love Blackie the sweet potato vine. I can tell you they don't grow like that in Indiana! And I love your use of the old wheelbarrow. Someday my beloved wheelbarrow, which has been with me since the beginning, is going to wear out, then it will become a planter, hopefully. I love the black sweet potato vine. I use 'Black Heart' a lot and like to wind those long runners through green, non-blooming perennials to spice things up. It came back in my old garden after last winter. I bet it comes back in Katy too, eh? I wish I were joining you in SC but, alas, not this year. Your view through the GG looks amazing especially considering the heat and dry. Can't wait to see the red lily bloom. That's a great vine! It's so interesting to see them creeping on the ground, I think. I always think vertical when I think of a vine. Have a wonderful time at GWA in September! I'm so bummed I can't make it! Just when everything else seems to be struggling, those Ipomea vines start going crazy. I guess we should consider them a good plant for the dog days! Although your pond area does look shady (for waterlilies), it looks like a very inviting place to hang out. I hope your lily in a wheelbarrow blooms for you now.